Actually, that question sounds a little funny to me, as when growing up in Central New York, I doubt anyone used to say that. I never heard it anyhow. But, it seems to be a growing trend now a days as people not only do something for Presidents Day but Presidents Week! Presidents Day falls on the third Monday of February, making it a 3-day weekend. However, as a three day weekend may not be enough, some take off the whole week - starting with Presidents Day, or most likely, the third week of February- making it Presidents Day Week or Presidents Week. Most salaried positions (unless working for the state or government) probably have to take the day or days off as Presidents Day is not typically a day most offices have as a paid holiday. In fact, though almost all states commemorate Presidents Day on the third Monday of February, not all do (more on that below). As I am getting used to living in the US again after being out for more than six years, I am not only being reacquainted with stuff I forgot, but I am learning a lot of new things as things in the US certainly have changed over the time period I lived in India. So, when I went to ask people, “Do you do anything for Presidents Day or Presidents Day Week?” I got a lot of interesting answers, which I will share below. Ideas of things to do for Presidents Day Week 2019. Growing up, there were people who went on ski vacations, but most people I knew would have preferred to go on a beach vacation to Florida. Living in Upstate New York, most people get sick of snow, and the last thing they wanted to think of was snow. Maybe Floridians or people from hotter climates in the US would travel to Vermont or other places in the Northeast for ski vacations as they may get sick of hot weather? In fact, it must have been true because in 2000, I heard that there were ski resorts in Vermont and New Hampshire booked up for more than 10 years in advance! It’s hard to believe, but true! Now a days, other popular ski vacation destinations include Park City (near Salt Lake City, Utah), places near Jackson Hole, Wyoming (near Grand Teton National Park), places in Colorado (Telluride, Aspen, Vail, Aspen, Breckenridge), and Sun Valley in Idaho, among others. Moving to Utah this year, I was surprised to see how the news channels were all saying that some of the Mighty 5 National Parks (Zion, Capitol Reef, Arches, Canyonlands and Bryce Canyon) would be overcrowded for Presidents Day and possibly the entire week. 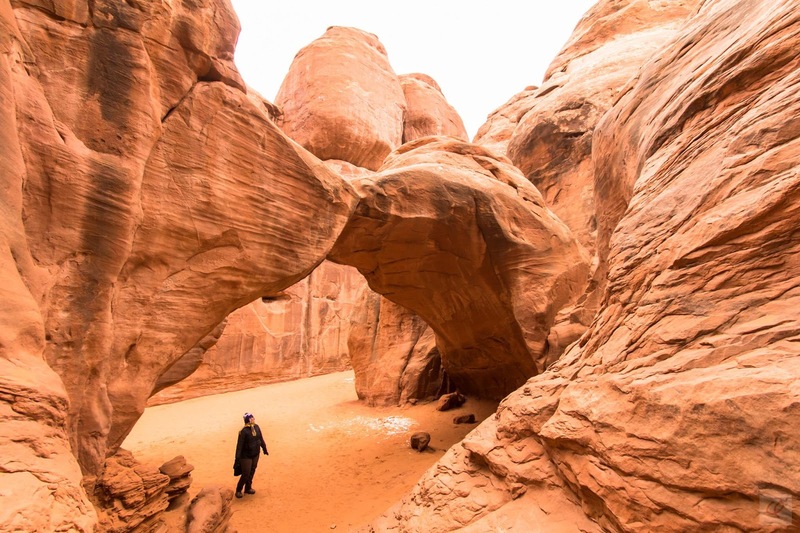 In fact, there were specific events such as the Bryce Canyon Winter Festival and the Moab Red Hot Marathon (with routes through or by Arches and Canyonlands National Park and Dead Horse Point State Park). As all the events would be going on during a vacation weekend, hotel prices were 1.5 to 3 times higher than even the weekend before that (I had personal experience with booking in Moab, and was sticker shocked into going the weekend before Presidents Day.) And, from what I hear others going on trips to other parts of the US had similar concerns. Author, Jennifer Kumar, at Sand Dune Arch in Arches National Park. Book as far in advance as possible for hotels, flights, rental cars or anything you may need a reservation for. Some websites were suggesting booking as early as the third week of January (around Martin Luther King Jr. Day). Even if this doesn’t save money, it will help secure a spot as seats on flights fill quickly and rooms in hotels also can book up pretty fast. Keep in mind if going to any of the Mighty 5 during this off-season, many businesses may not be open in these small towns, so choices will be limited. When checking in to your hotel, it may be a good idea to ask if you need to reserve a table at a nearby restaurant to avoid waiting in lines (when we went to Kanab in December we did not reserve a table, and some restaurants had a one hour wait). For additional tips to save money in hotels in the U.S., read this post. Go to locations in the US that don’t celebrate Presidents Day this time of the year. Since most school kids are off school this week, many parents of juniors or seniors (11th or 12th graders) may take their kids on a college tour. Arranged by colleges, free of charge to prospective students, these tours can help you make a decision as to which college your child may prefer to attend. Check college website admission office websites or Facebook pages for details on tour dates, times and sign up information. The week of Presidents Day coincides with National Engineers Week. It is said that this particular week was chosen as George Washington (who’s birthday coincides with Presidents Day) was the first American engineer. During or around this week, schools may hold events to promote STEM (science, technology, engineering and mathematics) careers. Companies in the STEM or engineering fields may also commemorate employees or hold events in relation to this. When is there not an occasion for a sale in the US? (That’s a rhetorical question!) The first Presidents Day Sale I ever remember going to was in 2002 (there may have been “Presidents Day Sales before that, but I wouldn’t have cared to notice.). That sale was in a department store. The best deals were found on the end of the season winter wear. Besides winter jackets, boots, mittens, hats and any other winter gear, you may also find good deals on cars, household appliances and mattresses. Note: For those with younger children, sometimes one parent may elect to take time off to avoid higher child care charges when school's out. If you work with Americans from offshore and are interested to learn more about American culture to build better relationships, check out our programs on Small Talk and Virtual Team Meetings. We also offer one on one executive coaching. Contact us today! Is Kerala the Florida of India? Americans and the Over-scheduled Vacation?